CPQ is a proven way for companies to accelerate the vital quoting and sales process. But CPQ has now moved beyond its traditional definition and evolved to support more aspects of the customer lifecycle. 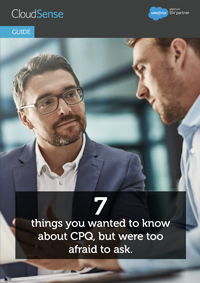 To quickly give you the basics of CPQ, we’ve covered 7 need to know questions in our easily digestible guide. How to sell CPQ internally if you think your business needs it.